Continuing efforts to snare anelusive share of commerciallaunches, the Japanese government and industry are planning upgrades tothecountry's H-2A rocket to make it more competitive in the globalmarketplace. First reported by Japanese media inSeptember, theimprovements were the subject of a detailed presentation at the 61stInternational Astronautical Congress in Prague. The first phase of the H-2Aupgradesshould be operational by the mid-2010s, enabling the launcher to moreeffectively carry dual payloads to polar trajectories and deploycommunicationssatellites closer to their targeted geosynchronous orbits. Engineers are following a blockapproach to keep the H-2A'shigh reliability and reduce development costs while introducing newcapabilities, according to Takashi Nakamura, project manager for thepost-H-2Alaunch vehicle program at Mitsubishi Heavy Industries Ltd.,the rocket'scontractor and commercial operator. 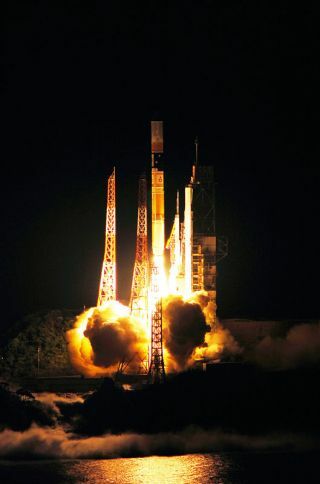 All H-2A launches to date havecarried primary payloads forthe Japanese government, but MHI will orbit South Korea's Kompsat 3reconnaissance satellite in 2011 or 2012. Kompsat 3 is the H-2Arocket's firstmajor commercial passenger. Like most Earth observationsatellites, Kompsat 3 willcircle the planet in a sun-synchronous orbit permitting consistentflyovertimes all around the world. One of the H-2A upgrades will enhancethe rocket's abilityto deliver two satellites to sun-synchronous orbits at differentaltitudes. Thecurrent incarnation of the rocket can inject two satellites at the sameheight,according to Nakamura. "With an upgradedH-2A,we'll have the capability to launch dual payloads to differentaltitudes,"Nakamura said. Rocket designers plan to introducenewly-qualified featuresof the launcher's LE-5B second stage engine, including low-thrustfirings atthrottle settings of 60 percent and 3 percent, according to Nakamura. The 60 percent thrust mode was testedin flight in 2002 andan H-2A mission in May demonstrated a pressure-fed firing of the LE-5Bengineat 3 percent thrust. More ground tests are on tap in thenext few months toinvestigate other low-thrust engine settings, Nakamura said. A slightmodification to the rocket's guidance system will also make possiblebriefupper stage engine firings needed to make small altitude changes. The other objective of the H-2Aevolution program is toheave larger communications satellites to orbit and drop them closer totheirultimate destination. Engineers are crafting methods ofmanaging the H-2A upperstage's usage of propellant. The rocket burns cryogenic liquid hydrogenandliquid oxygen, which must be maintained at super-cold temperatures toremain ina liquid state. Nakamura said the H-2A upper stagewill be painted white toreduce the vaporization rate of cryogenic liquid hydrogen. Engineershope tosave liquid oxygen by employing a different engine chilldown sequencebeforeeach ignition, reducing the consumption of oxidizer. Unburned hydrogen gas could alsosupplement chemicalthrusters to control the upper stage's orientation between burns,conservingmaneuvering fuel, Nakamura said. The changes will allow the H-2A upperstage to ignite threetimes and coast for up to five hours each mission. The extra LE-5Benginefiring will place communications satellites closer to their ultimatetargets ingeosynchronous orbit 22,300 miles above Earth. Rockets routinely releasecommunications payloads short oftheir final destination, and the satellites must use an on-board enginefor therest of the journey. If a spacecraft doesn't need to travel as far, itcan saveits own fuel and extend its useful life. Japan is also designing a new payloadadapter fitting toconnect satellites to the H-2A upper stage, giving spacecraftpassengers a morecomfortable ride during liftoff. The H-2A improvements will costnearly $200 million,according to Japanese officials. "The modifications to the vehicle arerelatively minor,and they are based on proven technologies," Nakamura said. The Japan Aerospace ExplorationAgency is also renovatingfacilities at the Tanegashima Space Center, the H-2Arocket launch site. Japan is already evaluating areplacement rocket for theH-2A, but its development has not won final government approval and itsfirstflight is not anticipated until the 2020s, Nakamura told SpaceflightNow. Dubbed the H-X in planning documents,the new launcher wouldbe designed to human-rating standards to support a potential Japenesemannedspacecraft. "Although we know that there are manyobstacles forrealization of human transportation in Japan, the discussion of thisissue hasbeen more open in recent years," Nakamura said. The Japanese government is alreadyfunding studies ofupgrading the H-2 Transfer Vehicle, an unmanned resupply freighter fortheInternational Space Station, to return to Earth with cargo. Ifapproved, there-entry version of the HTV could be designed with a clear emphasis onitsfuture applicability as a manned spacecraft. Engineers have settled on the H-X'sbasic configuration. Itwould likely be a two-stage vehicle with liquid-fueled engines and nosolidrocket motors. But officials have not determined thespecifications andnumbers of the engines for the H-X rocket, Nakamura said.